Champagne is the wine of celebration, or if you were Marilyn Monroe it’s just bath water. The Night They Invented Champagne! Only French wine from the Champagne region is truly considered champagne. Champagne is sparkling wine produced by a traditional method named for the Champagne region of France. True “Champagne” only comes from this region near Reims, Epernay and Ayers in northeastern France, and accounts for 20 percent of all French wine and spirits production. The word is derived from the Latin campagna, meaning countryside, a name for this area of France since the Middle Ages. Although other French wine-producing regions claim to have made sparkling wine earlier, this area was the first place to produce it in significant quantities. What makes champagne unique is that it’s made by a process called the “methode champenoise,” and requires that a second fermentation be done in the bottle, the one that you take home from the store. The natural by-product of yeast working on grape sugars is carbon dioxide, which stays in the wine since it can’t escape from the tight enclosure. The first fermentation produces still, acidic wine. Before this is bottled, a small measure of wine, sugar, and yeast is added (known as the liqueur de tirage) and the bottle is sealed. The liqueur de tirage triggers a second fermentation inside the bottle, and the carbon dioxide bubbles are trapped inside. Next comes the process of riddling, or remuage. The bottles are arranged in special automated racks, tilted upside down and turned at regular intervals to shake the yeasty deposits down into the neck of the bottles so that it can be removed. At the end of this process the neck is frozen and the bottle opened to allow a plug of icy lees (sediment) to shoot out (dégorgement). The bottle is then topped off with a small amount of still wine and sugar solution (called liqueur d’expédition) and resealed. Wines with bubbles but not produced in the French Champagne region are called “sparkling wines”. Sparkling wines can be made by carbonation (like soft drinks), made quickly in large vats, or made by the methode champenoise. French sparkling wines from other regions are restricted to words like “Methode Traditionnelle” or “Methode Classique” to indicate adherence to the classic methods, but they may not use the words champagne or méthode champenoise. Some examples of sparkling wine from other countries are Italian Spumante, Spanish Cava and German Sekt. French law, not international law, controls the use of the word “champagne.” As a result, producers from other countries including some American wineries call their sparkling wine “champagne” without any legal repercussion. There are several factors in choosing a bottle of fine bubbly: price, quality, taste and even bottle size. How do you determine quality champagne? It’s in the bubbles. 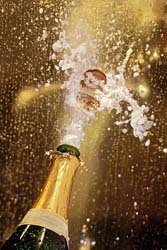 There are 49 million bubbles in the average champagne bottle, according to some scientific research. Small pinhead-size bubbles indicate the finest Champagne; big bubbles (like seltzer) are not so desirable. Big champagne bubbles are called “oil de crapaud” or “toad’s eyes” in French. Champagne is usually made as a cuvee, or a blend of three kinds of grapes (two reds and one white) — Chardonnay, Pinot Noir and Pinot Meunier. The more white grapes in the blend, the lighter the Champagne. More red grapes give the champagne a fuller flavor and a darker color. The term Blanc de blancs signifies the Champagne is made entirely from white grapes, usually chardonnay, which produces a lighter, more elegant taste. Blanc de noirs indicates white wine made from red (black) grapes, usually Pinot Noir, which produces a fuller bodied, richer or fruitier Champagne. It’s often pale gold in color with a hint of pink. Rose is a pink color, produced by blending in a little red wine or leaving the dark skins of Pinot noir in the wine making process longer. The containers used for the first fermentation can also influence the flavor. Wood casks tend to give a fuller body and bouquet than Champagne fermented in stainless steel. Champagne also comes in choices of sweet or dry, indicating sugar content. Ultra Brut or Natural is the driest champagne available. It’s maybe too dry for some tastes, but does pair up with some hard-to-match foods due to its clean purity of flavor. It’s created by not giving the wine a “dosage” (a French term for a small amount of sugar syrup that is added to virtually all champagne before the final corking). Brut is very dry and is now the standard for fine champagne. Dry champagne was created in 1876 due to British demand. Brut has less than 1.5% sugar. Extra dry or Extra Sec has 1.2 to 2% sugar (actually not a dry as brut despite the name) and is fashioned by adding a little more sugar to the dosage, which results in a softer and smoother champagne without being too sweet. Sec is medium sweet, with 1.7 to 3.5% sugar. Demi-sec (very sweet champagne), more suited for dessert, which is produced by increasing the dosage to leave some of the residual sugar intact (3.3 to 5% sugar) after the secondary fermentation. Doux is the sweetest, with over 5% sugar (dessert champagne). Crémant, another designation for sparkling wine is French for “creamy” and traditionally refers to a sparkling wine with less pressure and softer effervescence. It’s usually sweet. Sparkling wines designated Crémant are produced using the traditional method, and have to fulfill strict production criteria. In France, there are seven appellations for sparkling wine which include the designation Crémant in their name. Since the designation Crémant is not reserved exclusively for French use it may also be used by producers in other EU countries which fulfill the production criteria, although such usage is rare. Vintage champagnes are a made using only the grapes harvested from a single year. Most champagnes are a blend of different vintages, so there is no year on the label. In the best harvest years, however, many producers do bottle some of the harvest as vintage, rather than blended to show off the characteristics of that particular year. Vintage champagnes are, of course, more expensive. above the temperature of 38 degrees Fahrenheit. Champagne should be stored in a cool, secure place. It won’t improve, so don’t bother to keep it for too long. It actually deteriorates after three or four years. James might have preferred his Dom a bit too cold, but who is to argue with him? Champagne is to be served cold, at between 43 to 48 degrees Fahrenheit or seven degrees Celsius. To chill, place the unopened bottle in an ice bucket with one-half ice and one-half water for 20 to 30 minutes, or refrigerate it for three to four hours. Another benefit is when bubbly is properly chilled to 45 degrees Fahrenheit the pressure inside the bottle is reduced by one atmosphere of pressure, or approximately 14 pounds per square inch. Never put the bottle in a freezer. Champagne is under a lot of pressure and a bottle that explodes in the freezer is not pretty. And sorry, but you’ll never be able to add a champagne label to your scrapbook. Since the bottle is designed to chill in water, the label glue, unlike other wines, is waterproof. Once the bottle is properly chilled, you’re ready to open it. The first step to the traditional method is to cut the foil around the top of the bottle, only removing enough of the foil to be able to loosen or remove the twisted wire hood. To keep the cork in place until you’re ready to remove it, place your right hand, thumb or palm over the top of the cork. Don’t move your hand too far away from the cork until you have it out of the bottle. Drape a towel or napkin over the bottle top and wrap it clockwise around the bottle to prevent slippage. Hold the towel pressed against the middle of the bottle with your left hand. The towel will catch the cork, keeping it from becoming airborne, and it also will insulate the bottle from your warm hands. Do not let go of the towel until the cork has quietly slipped out of the bottle. Feeling for it through the towel, undo the small metal loop that holds the wire cage tight and twist it counter-clockwise until the entire cage becomes loose. Champagne connoisseur, Jack Van Nort, tells me that the number of turns is exactly five and one half! foil off, leaving the towel in place. Hold the champagne bottle at a 45-degree angle in front of your stomach, pointed away from anything or anyone of value. Tighten your grip on the cork and twist the bottle clockwise. Be sure to turn the bottle instead of the cork. Slowly and gently ease the cork out of the bottle. You want silence. Loud pops are a sign of champagne-opening failure. There is an old saying “The ear’s gain is the palate’s loss,” meaning that loss of carbonation at this stage affects the taste. For the fullest flavor you want the bubbles in the wine, not on the wall. Once the cork is loose, your mission is to control the 80 or so pounds per square inch of pressure underneath the cork. Hold onto the bottle too, it also could shoot away. Stubborn corks may require champagne pliers, which give you a vise grip on the cork, and are available at your local wine shop. A loud, gushing uncorking is the sign of a champagne-opening amateur. The proper glasses for serving champagne are the long-stemmed, narrow flutes or tulip-shaped glasses, which reduce the wine’s surface area and keeps the bubbles from dissipating quickly. Avoid wide and shallow glasses, which were very popular but were never designed for drinking champagne. Those champagne coupes (meaning “saucer-shaped”) were reportedly molded from the bosom of Marie Antoinette. The legend may be true, since the Sevres porcelain factory did take a cast of the French Queen’s breast to produce four white bowls for her Dairy Temple at the Chateau de Rambouillet near Versailles. Chilling the wine glass is not recommended. Another tip is that the surface texture of crystal is rougher than ordinary glass, so more bubbles form on crystal glasses. Finally, wipe the bottle neck with a clean linen and begin pouring by holding the bottle base firmly in one hand with the thumb in the punt (bottom indentation) and the fingers spread out along the barrel of the bottle. Guide the bottle neck with the other hand. Pour a little, an inch or so, in each glass allowing the froth to settle, then top off. Now you’re ready for a toast. If you don’t consume the bottle in one sitting, hard to imagine, you can use champagne stoppers, which are made especially for the purpose and place the bottle in the refrigerator. It should be good for several days. The handle of a silver spoon left dangling into the neck of the bottle will keep the wine sparkling for a few hours. Look for a range of various shades of yellow. Straw to gold is good, but brown indicates the Champagne is past it! French Study Concludes Best Way to Pour Champagne! French scientists (who else?) just completed a study on the best way to pour a glass of champagne! Their report appears in ACS’ Journal of Agricultural and Food Chemistry (August 2010). 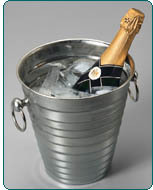 The study concluded that pouring bubbly in an angled, down-the-side way is best for preserving its taste and fizz. The study also reports the first scientific evidence confirming the importance of chilling champagne before serving to enhance its taste, the scientists say. The scientists studied carbon dioxide loss in champagne using two different pouring methods. One involved pouring champagne straight down the middle of a glass. The other involved pouring champagne down the side of an angled glass. They found that pouring champagne down the side preserved up to twice as much carbon dioxide in champagne than pouring down the middle — probably because the angled method was gentler. They also showed that cooler champagne temperatures (ideally, 39 degrees Fahrenheit) help reduce carbon dioxide loss. Even if your opening champagne in the locker room after the big win, follow this careful cork removal method, then if it’s really necessary, you can hold your thumb on the opening shake the bottle and get everyone sprayed. Or if you really insist on spraying the room with champagne and take out a window or two, use the method of grasping the bottle at the neck with both hands. Press your thumbs against the sides of the cork, after the wire cage is removed, and press on one side then the other. By rocking the cork it will pop from the bottle followed by a foam shower. Dom (Pierre) Perignon, a blind monk from the Abbaye (Abbey) Benedictine d’Hautvillers was in charge of the abbey’s wine making from 1688 to 1715. He developed the Methode Champenoise, and is given credit for discovering Champagne. The Romans planted the first vines in the Champagne region, which sixty-five million years ago was under a prehistoric sea. The seawater left the soil laced with limestone giving the wine a mineral flavor. The area was also cold and windy most of the year so that grapes rarely completely ripened to make good still wine. The discovery of secondary fermentation, the process that produces the bubbles, came about one year (around 1698) when an early onset of cold weather after harvest arrested the fermentation. The following spring, rising temperatures began a secondary fermentation in the barreled wine. Sparkling wine was not the desired product for Dom Perignon. Secondary fermentation rarely occurred and was though to be a defect in the wine. That thinking was erased with the famous tasting by Dom Perignon and the effort to produce and perfect this “defective” wine begun. Little was know about controlling fermentation by temperature. The monks discovered that the finished wine was considerably improved if the secondary fermentation was contained in the bottle rather than the oak barrels. Unfortunately glass making wasn’t able to create bottles that could contain the finished product, which created a pressure of 80 to 85 pounds per square inch in the bottles. They exploded at the slightest rise in temperature. Dom Perignon developed blending, pressing and clarification techniques. He began to use the stronger English bottles closed with Spanish cork instead of the wood and oil-soaked hemp stoppers then in use. In 1735 a French Royal ordinance was instituted to dictate the size, shape, weight, cork size and secured with strong pack thread to the collar of the bottle. Skeptics point out that there is some historic evidence that there was sparkling wine being produced and consumed in London during the 1660’s! Jeroboam The name means “large bottle” and was named for a King of Northern Israel, Jeroboam I, who died in 912 B.C. Rehoboam This name means “very large bottle” and is named for the son of Solomon who died in 922 B.C. There was a revolt against Rehoboam and he lost the northern portion of his kingdom and ruled southern Judah. Methuselah Named for the theory that the bigger the bottle the longer quality champagne will be able to age, in a big enough bottle even to Methuselah’s age! Methuselah was the Biblical individual who lived 969 years and has become a synonym for longevity. Salmanazar Name comes from Salma, a capacity measure used in Italy. Balthazar Named for one of the three Kings or wise men that brought gifts to the infant Jesus and meaning “King-sized”. Nebuchadnezzar Named for the King of Babylon from 605 to 562 B.C. under whose rule Babylon flourished and representing the biggest King-size.